Can Technology Bridge the Schism of Politics? | Alidad Mafinezam, Ph.D. 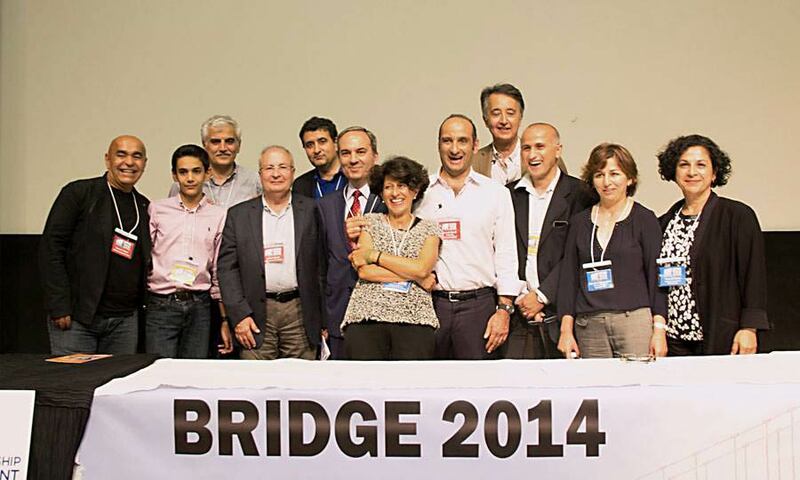 The Bridge 2014 gathering on “High-Tech Entrepreneurship in Iran,” held at the Wheeler Auditorium of the University of California at Berkeley on the first Saturday of September, broke new ground on multiple fronts. It drew seven hundred people from across the U.S. and internationally. Over a dozen leading academics and entrepreneurs came from Iran itself, to explore the potential of high-tech manufacturing, E-commerce and Internet-based services to advance development in the country, and ways of building bridges between Iran’s entrepreneurial ecosystem and its large and wealthy diaspora in the U.S. as a gateway to the world of innovation and finance. Three dozen speakers addressed the gathering. The quality and spirit of their input represented tech savvy and significant wealth combined with sympathy and goodwill – an indispensable combination for offering workable solutions to a crisis-ridden world. The venue matched the positive energy and the high calibre of the contributors. As the leading state university in the U.S., and among the best in the world, the Berkeley campus typifies the openness and academic rigour that has underpinned Silicon Valley’s reliance on top talent and a “can-do” spirit in science and engineering. A sizable portion of such talent comes from China, India, and Iran to Berkeley and Stanford for graduate education before joining the high-end of intellectual capital that underpins the ongoing technology revolution, which was spawned in the Bay area a generation ago. In terms of its numbers and the heights to which it has risen in Silicon Valley, the Iranian diaspora can indeed be placed in the same league as its Chinese and Indian counterparts, who have made profound contributions to these two giants’ technological and economic advancement and meteoric rise over the past generation. And yet, unlike China and India, Iran has not been able to harness the technological prowess of its diaspora in Silicon Valley. The Islamic Republic of Iran, after all, is the world’s most sanctioned country, over $100 billion of whose assets have been frozen by the world’s largest economies on suspicion by the U.S. and European countries that it seeks to build nuclear weapons. Virtually all trade and investment with Iran are forbidden by a series of U.S., E.U. and U.N. Security Council sanctions that have targeted the country’s oil and banking sectors, imposing exorbitant costs on the country and, by most accounts, the region of which Iran is such an integral part. The official rhetoric coming from Tehran remains opposed to U.S. influence in the world as it reiterates the 1979 Islamic revolution’s anti-American ideology for continued sustenance. The Berkeley event was all the more impressive for being held against such a fraught background. Robert Price, Professor of Political Science and the Associate Vice Chancellor for Research at Berkeley, helps oversee the university’s domestic and international partnerships. He inaugurated the conference via teleconference from Paris, welcoming the guests on behalf of the University of California and the Charter Members who had sponsored the event. When used together, the words “Iran” and “high-tech” are more likely, he said, to bring to mind computer viruses that were unleashed on the country’s nuclear program or the continuing focus on prohibited “dual use” technologies. Yet, he added, if sanctions on Iran are lifted, with a population of 80 million, high levels of education, and the outstanding achievements of the Iranian-American community in the high technology sector, Tehran could become a regional entrepreneurial hot-spot. It is thus important to explore what should be done to alter conditions that hinder entrepreneurship. Jack Citrin, the director of Berkeley’s Institute of Governmental Studies, took to the podium to welcome the participants. He cautioned that two processes are colliding across the world: economic globalization that promotes interaction, versus the political and security polarization, which are pulling people apart and creating divisions. The need for building more bridges between the U.S. and Iran is especially palpable now, he said, pledging Berkeley’s support for such academic exchanges. The first keynote speaker was Behrouz Abdi, CEO of Invensense, which is a publicly traded chip maker based in San Jose, California, with half a dozen offices across Asia. The firm designs and manufactures motion tracking micro devices. In his talk Abdi drew a broad picture of the technology revolution since the late 1970s and early 1980s, calling it the “other revolution” in contrast to the religious and political one that came to Iran in 1979. Technology has lowered entry costs and entrepreneurs can be empowered much more readily than before, Abdi said, outlining the vast advances in China and India in the past decade as these countries have become central parts of the high-tech supply chain, while acquiring a significantly larger share of the global economic output. Leading a company with offices in Japan, Korea, China, and Taiwan, Abdi reminisced of the time in recent memory when there was no direct flights between China and Taiwan, and called the establishment of direct air links between the two as a sign of the recognition that the demands of progress and economic competitiveness outweigh politics and ideology. This new openness has been part of the reason that over the past decade the number chip makers in China has grown four-fold, reaching over 500. He voiced his belief in intellectual and scientific talent of Iranians which, if harnessed, could transform Iran into a regional leader in technology and services. Kamran Elahian, one of the event’s main organizers, is a leading entrepreneur and investor in technology start-ups in Silicon Valley and around the world, who has worked with entrepreneurs in over a dozen countries from Asia and Europe to Latin America . He came to prominence in the early 1990s, leading a series of successful IPOs for technology start-ups. Along with his wife Zohreh, Elahian is credited with launching Schools Online internationally and for numerous other philanthropic pursuits. He gave a motivational speech that drew on Mahatma Gandhi’s saying that “You have to become the change that you wish to see in the world.” Questioning the orthodoxies that had imposed artificial limits on his people, Gandhi’s philosophy created an environment that in time enabled Indians’ potential to be realized, and for the country to become a technological and economic powerhouse. We have Doctors Without Borders, Elahian said, why not have a similarly ambitious Entrepreneurs without Borders that can promote positive change across the world, he asked. The high-tech community can and should make a more concerted effort to tackle the world’s challenges, he said, then drawing a fundamental distinction between the speculative economy and the innovation economy, that are based on two fundamentally different philosophies and ways of generating value — the key difference being that the playing field is far more levelled in the latter, and the benefits are far more broadly shared. Maryam Rofougaran was another keynote speaker. Now in her mid-forties, she is a leading inventor and Iranian-American entrepreneur who holds 99 patents, some of which pertain to blue-tooth and wifi wireless applications. Along with her older brother Reza, she is credited with having helped put wifi and blue-tooth on an affordable chip, thus having “revolutionized the whole field” in the words of Frank Chang, chairman of the Electrical Engineering Department at UCLA, from which both siblings hold PhDs. She addressed passion and perseverance as the two wings of successful entrepreneurship and highlighted the historical contributions of Iranians to the worlds of science and scholarship, naming Avicenna, Kharazmi, Tousi, and Khayam as examples of Iranians who made seminal contributions to the world of science and philosophy in their time. She called Iran a rich land of art, culture and civilization whose contemporary image has been marred due to political reasons. Despite this, she said, the Iranian-American community is one of the highest achieving immigrant groups in the U.S. and has produced scholars, scientists, entrepreneurs, and businessmen and women who have contributed to all fields of endeavour in America. She moved to the U.S. to study in the mid-1980s in her teens, after finishing high school in Iran. Her heros were Newton and Einstein, who revolutionized physics, and she dreamt of one day winning a Nobel Prize in science. While she didn’t reach her dream, she said, the energy the dream ignited in her mind led to other achievements and breakthroughs, among the most rewarding of which has been to help Broadcom, a multi-billion dollar chip maker to become globally competitive in wireless technologies. The technology entrepreneurs who visited from Iran seemed equally innovative. Nazanin Daneshvar, in her late 30s, is founder of a leading Ecommerce site, “Takhfifan.com” serving as a smaller version of Amazon.com for Iran. After three years of operations, the site has over a million subscribers and has been experiencing steady growth. Having studied in Britain and worked in Germany in technical positions, Daneshvar referred to the calling for making a difference as one of the reasons she returned to Iran to launch her company. With over 50 percent of Iranians using the Internet, she seemed hopeful that the Iranian E-commerce market retains significant capacity for growth. Fereidun Ghassemzadeh is founder of the Tehran-based Afranet.com a leading Internet Service Provider in Iran that has a user base in the millions. He said over 900 thousand Iranians are graduates of IT-related fields and that the country maintains significant human capital in this area, calling Iran the largest untapped IT market in the Middle East. With an estimated market size of over $18 billion, he pointed out that only one-third of this figure was tapped, leaving a large gap, which could be filled by the well-placed and technologically savvy Iranian diaspora. Mahmoud Nazzari was another speaker and leading Iranian technology entrepreneur, and founder of System Group, which is among Iran’s leading providers of business software solutions, with over 20,000 customers in the cement, tile, cable, and petrochemical sectors. He bemoaned the challenge of “brain-drain” with the best and brightest Iranian students looking to emigrate and expressed his hope that with a relaxation of sanctions members of the diaspora could get involved in the country’s information technology sector. Farshad Nowshadi is a UK-based senior advisor on technology and online banking to Saman Bank, a publicly traded financial institution with 250 branches across Iran. Since 2007, he has been a regular business visitor to Iran, and his impetus was partially responsible for enabling Saman Bank to be the first in Iran to offer online banking. Nowshadi described the “explosion” in the mobile market in Iran, with over 120 million mobile phones, close to 1.5 phones per Iranian. Over 33,000 ATM machines exist in Iran catering to over 280 million debit cards in an economy that is the 20th largest in the world. He voiced his optimism in the future of the largely untapped Iranian market. Farhad Rahnema of Rahnema Group of Companies was another leading tech player from Iran at the event, whose firm includes over a dozen start-ups that are involved with scores of technology parks across Iran. He echoed other participants’ call to enhance interaction between the venture capital and technology entrepreneurs in the U.S. and Iran. There are over 6 million mobile internet users in Iran, and over 10 million regular social media users, Rahnema said, and yet the entire E-commerce market in Iran is $500 million, which shows large room for growth. He highlighted the gap in educational institutions, which, despite the high potential of Iran’s talent pool, do not effectively teach “soft skills” or business and management acumen that enable the economy to flourish. He called for a culture that attaches more value to long-term investment, open-ness to calculated risk taking, and more investment from private sources into Iran’s ecosystem. In the week before the event, Rahnema said, 3G, 4G and LTE technologies were introduced in Iran and soon found millions of eager users. Yahya Tabesh, Professor of Mathematics and Computer Science at Iran’s Sharif University, mentioned the pride he takes in his former students, congratulating Maryam Mirzakhani, the first woman to win the Fields Medal in mathematics, now at Stanford (where Tabesh has an adjunct appointment), as an example of the high talent that Iranians have in math and science. He referred to Iran’s relatively developed university network as a major asset for the country, pointing to the 100 public and 500 private colleges and universities that dot Iran’s landscape. He mentioned the weak private sector, the fact that the country is cut-off from the world economy, and lack of IP protection as obstacles that would need to be addressed if Iran were to truly harness its potential in this area. Another outlying Iranian-American scientist and technologist who spoke at the event was Babak Parviz, now a vice president at Amazon. Parviz holds a PhD in electrcial engineering and has done postdoctoral work at the cross-section of biology and circuits. Parviz is the creator of Google Glass and former director of Google’s X Lab. Despite the war and sanctions with which Iran has had to contend for over 35 years, Parviz expressed his continuing confidence in Iran’s future “because of the quality of our people.” He mentioned Iran’s massive natural resources and its human capital as major assets that could underpin significant growth in Iran. Using the examples of Finland, Singapore, Brazil and China, he pointed out that these countries have experienced tremendous growth in one generation, and have moved from largely agricultural economies to high-tech manufacturing. He highlighted the impact of the Indian and Chinese diaspora communities in the vast transformation of these countries and wondered out-loud about whether Iran could learn from their examples. Google executives were a prominent presence at the event: Roya Soleimani, a Communications Manager at the firm, was the event’s emcee; and Babak Pahlavan, head of Google Analytics, shared his “secrets” of success and highlighted the importance of mentorship. Along with the Elahians, Dariush Zahedi of Berkeley’s Program on Entrepreneurship and Development in the Middle East, Payman Arabshahi of the University of Washington, Amir Zarkesh of iCelero, and Yahya Tabesh of the Sharif University were instrumental in organizing the innovative gathering. The spectre has been raised: can technology and goodwill succeed where politics and ideology have failed? 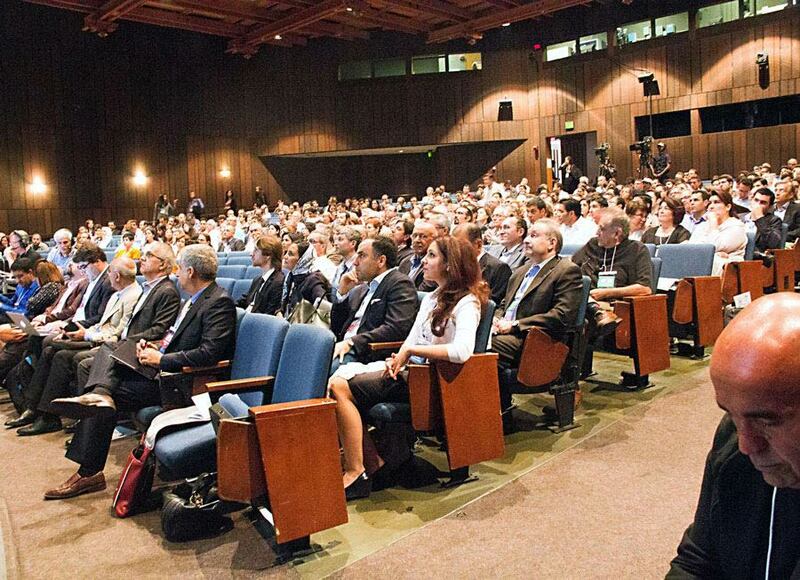 The Berkeley event showed the potential of three spheres whose combination can bring about major change: the universities as gathering places where governments and companies dare not go, the importance of diaspora communities in promoting understanding, mutual gain and development, and the role of technology and high-tech entrepreneurship in bringing down barriers. Tony Perkins, a leading Silicon Valley investor, who chaired a panel on the “Ecosystem for Sustainable Entrepreneurship” used the example of the Indian-born Vinod Khosla, the co-founder of Sun Microsystems, who has given generously to meet more of India’s development needs. Can a similar pattern be set with Iran, Perkins asked Saeed Amidi, founder of the Plug and Play Technology Center, one of Silicon Valley’s, and the world’s, leading technology incubators with hundreds of aspiring start-ups from across the world. The ties to Iran are incredibly strong, Amidi opined, and a sizeable portion (up to 20 percent) of the vast wealth of the Iranian-American community can be invested there. Only if politics and ideology get out of the way of goodwill and mutual growth. Pejman Nozad, another prominent Iranian-American technology angel investor issued a heart-felt appeal for patient capital, commitment, and investing in the future. In this particular sense, as the most sanctioned country in the world, Iran is the exception that proves the rule.